Scenic Weekend Getaways from Mumbai! One of the best beaches in India, Kashid is located approximately 130 kms from Mumbai. The beach is pristine and the mountains serene. Small gurgling streams complete a picturesque location. A drive around the beach can be a great romantic experience. For the family person there are fun rides on camels, horses and carts as well. For some power-packed fun one can opt for some surfing too. Around 100 kms from Mumbai, these hill resorts location can be reached via the Mumbai-Pune expressway. The drive itself is enjoyable if you are able to avoid rush hour traffic. These are twin hills and extremely popular. Very well-maintained and tourist-friendly, they have scenic views of misty hills and streams. The local eateries are quite popular as well. Hikers can go to the Duke’s Nose peak nearby which offers a splendid view of the valley called BhorGhat. (Ghat means valley in Marathi language). Another place of interest is the Tiger’s Leap. The valley appears from this point similar to a tiger trying to leap under careful observation. This is located around 120 kms from Mumbai in Nashik. It can be reached by the Mumbai-Agra National highway. A small hill station, it is tranquil and energizing. Nashik, known for its orchards and wine, is one of the most beautiful places in Maharashtra. The Western Ghats offer a splendid backdrop. The Ghatandevi temple and the magnificent Tringalwadi lake are nearby locations of interest. This city was once the capital of the iconic Maratha king, ChhatrapatiShivajiMaharaj. 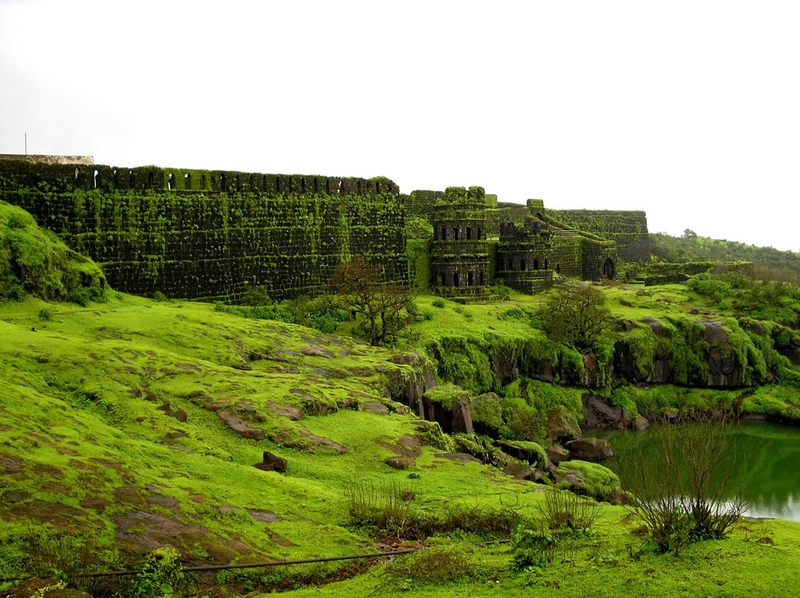 His fort, located in the picturesque Sahyadri mountain range is the major attraction for tourists. Built around 1674 much of it is in ruins now. However, it still retains its appeal due to its historic status. The drive offers a panoramic view of the hilly region and forests around. It is located around 110 kms from Mumbai. It is located along the river Pravara, about 165 kms from Mumbai. It is popular owing to the variety of recreation it offers. From waterfalls to peaceful greenery, it is the perfect place for a weekend getaway. Some other significant places of interest around here are the Arthur Lake, Wilson Dam and the Ratnagarh Fort.